Last week, Cathy asked if I “shop the ads”. The short answer is no, not really. Apart from keeping a price book, I keep my grocery-list making process pretty lean. 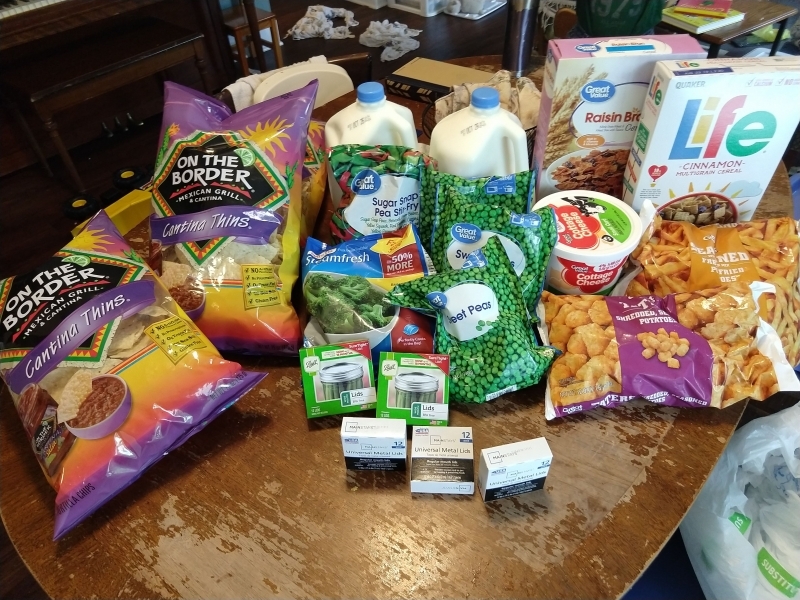 I do look through Sam’s Club’s “Instant Savings” booklet when it arrives in the mail and make plans to purchase bulk of any of the items we regularly purchase at Sam’s while they’re on sale. I also occasionally check ALDI’s sale flyer when I’m making my list for Thursday – but I’m just as likely to skip it. I do typically take a peek at ALDI’s meat selections when I’m in store and buy for the freezer when they’ve got cheap meat. Depending on how much I’ve got in the freezer already, I’ll buy a ham or a pork roast anytime they’re available for less than $1.50 per pound. Likewise, if there’s a good deal on the family pack of chicken breasts, I’ll buy a pack or two, cook them in my crockpot on low and then shred them and divy them into containers for the freezer to use later for anything that calls for chicken. But I don’t routinely look through the ads and base my lists off of them. Some weeks it seems it takes me nothing at all to exceed the $30 minimum for grocery pickup. Other weeks, I’m racking my brain to come up with more for my order. That’s the way it was this week, until I remembered that I need some more canning jar lids for the next time I get the yen to can. Those come out of my “household – consumables” budget, so my $37.02 order only contains $26.36 in groceries. 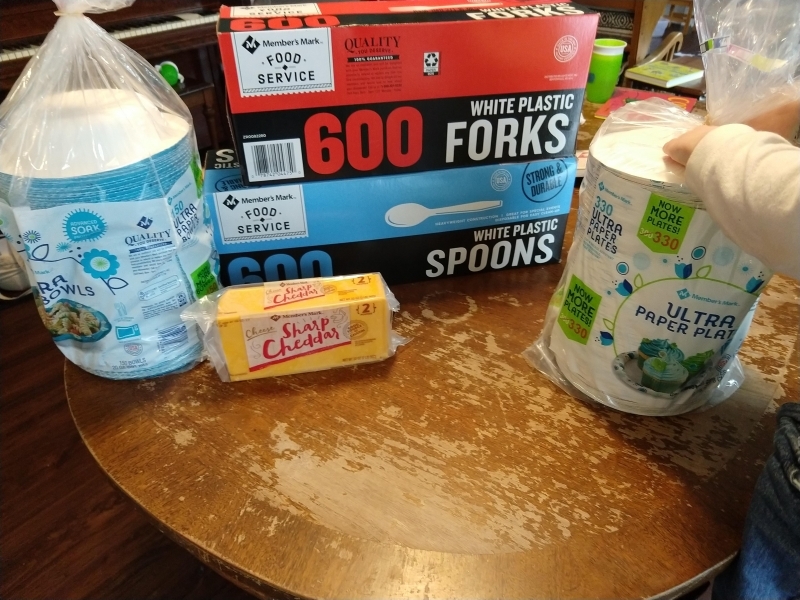 Our Sam’s Club order was almost entirely household consumables. Daniel buys the cutlery for his work group’s “snack days” and they need more forks and spoons. And we’ve decided that we’re going to use paper plates and/or bowls for Friday dinners at home so that Daniel and I don’t have to do dishes (or, as many dishes) before our Friday night “reconnecting” time. The only grocery item is our cheese, $6.43 for a 2 lb block. So we’re at $32.79 so far – $103.11 left for the rest of the week. ALDI had apples back at $1.49 for a 3 lb bag – which means we bought more apples to make applesauce with. Thirty-three pounds, to be precise. Beyond that, there wasn’t a terrible lot we needed since a lot of this next week’s meals are already in the freezer. 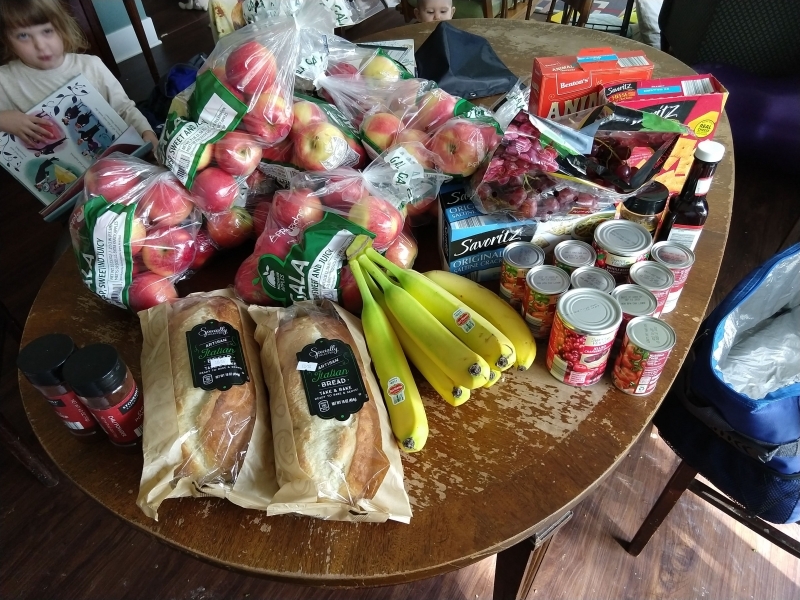 $39.16 for apples plus miscellany. So we’re ending the week $63.95 ahead, which is wonderful since we spend a LOT of money on coffee on the second Saturday of each month – and that’s tomorrow!